Well, at least he's trying. State Senator Michael Baumgartner, 6th District, held the second of his two town hall meetings at the MAC yesterday. Attendance was double over last year's town hall, with 25 people showing up this time. You would think more would be there since he represents 140,000 people, but my experience with state legislature town hall meetings in the 6th District has shown that sparse attendance is the norm. Baumgartner said that in the State Senate, the bipartisan coalition is focusing on the economy, education, and creating a sustainable budget. We will not see social issues brought up on the Senate floor, so don't expect to see them voting on bills concerning abortion, gun control, etc., even if it's a bill passed by the House. While he agrees those issues are important, the coalition has decided that the bill won't make the cut if isn't about jobs, education, and the budget. 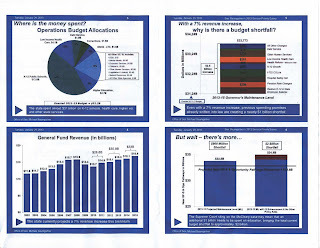 Bouncing through Powerpoint slides containing bar charts, pie charts, and line charts--some helpfully provided on a handout--depicting all manner of budget data, the senator did an excellent job of conveying how complex the state budget and budgeting process is. His presentation was befitting of someone who used to teach at Harvard, had he been teaching students who were already well-versed in the subject matter. Following the charts was mind numbing. He zipped through highlights at eye-glazing speed. Everything I noted came from what he said instead of what he showed. Low income health care is the fastest growing area of the state budget. Washington is the most trade dependent of all states and China is its most important trading partner. Washington is twice as dependent on federal defense spending than other states and will be hurt by sequestration if it is allowed to happen. Washington state's "system" is geared towards large corporations, not small businesses. People and small businesses generate wealth. High labor and environmental costs make it difficult for small businesses. 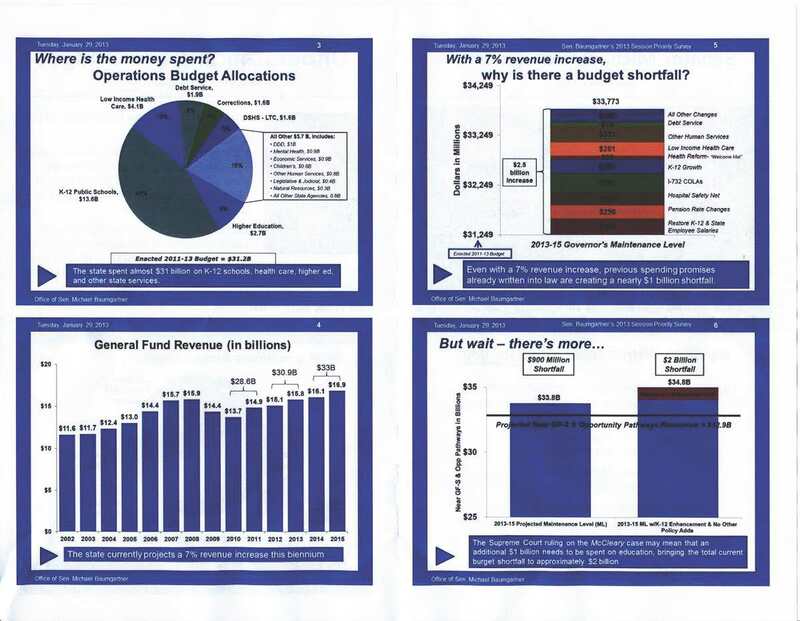 K-12 funding should include reforms that make funding performance based. A benefit of small attendance is that those present are more likely to have their questions answered. All they had to do was raise a hand and many of them did. The senator politely took on the subjects of health exchanges, bond interest rates and debt, raising revenue, the closed state tourism board and use of the hotel/motel tax, home schooling, early-age education, and illegal immigrant criminals who get on welfare as soon as they enter the country. Baumgartner seemed to have a good grasp of most of the topics and admitted when he didn't, but promised to email an answer. Unfortunately, due to a prior engagement, I had to leave before the meeting wrapped up so I didn't get to chat with any of the attendees. I think the woman expressing concern about illegal immigrant criminals draining the coffers via welfare would have been interesting to talk to.